No matter what medium or technique you use to depict your subject, always try to use a full range of values. Value is the lightness or darkness of a color. You can simplify value by thinking light, medium and dark. A good drawing should have all three. A tool I use frequently in drawing and painting is a value scale. You could easily make up your own any number of ways. The first one I made out of a page from a Pantone color formula guide mounted on a piece of foam core. 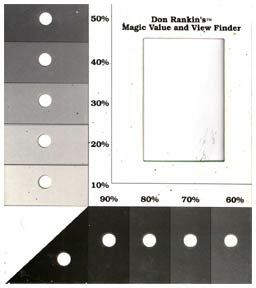 The second one, The Don Rankin Value and View Finder, is available through Cheap Joes’ Art Stuff. I like this one because there are holes in the card where the values are and you can hold it right over the area you’re evaluating to get a really good match. I recommend using a good quality spiral sketchbook, at least 6″ x 8″ or bigger with a medium weight drawing paper. I like the Strathmore 300 series, 9″ x 12″. 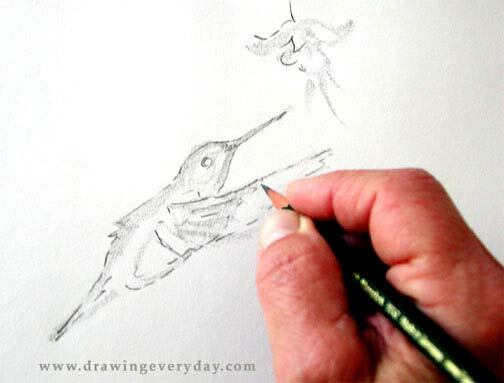 You’ll also need a soft drawing pencil (2B – 4B) and a kneaded eraser. 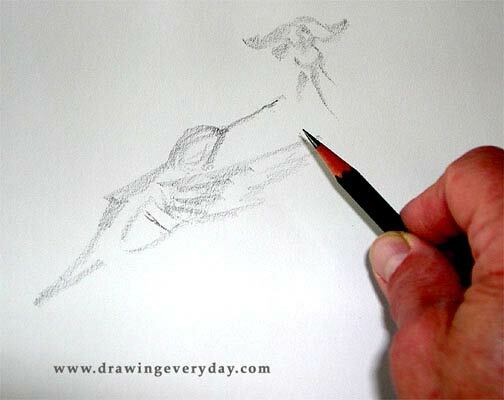 This drawing shows you how to hold the pencil when you first start your drawing. It’s so much easier to first block in shapes this way and keeps you loose without getting caught up in details too early. Ok, now you can tighten up a little and hold the pencil like you would to write. Add some of the main details. 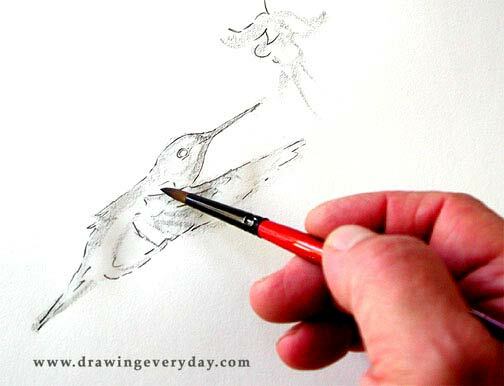 Correct and refine your sketch, but don’t get too nit picky! Keep in mind that this is an exercise. It doesn’t have to be a masterpiece! 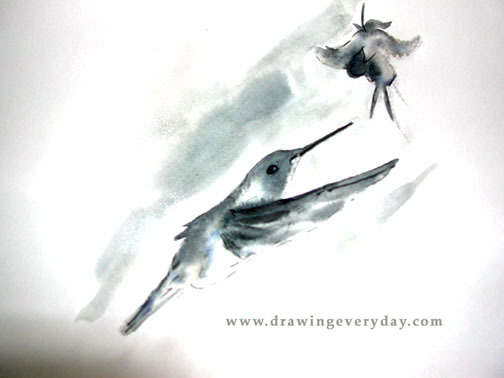 When out of the studio sketching, I stop with this step and add the wash later. So all you need to take out with you is a pencil, eraser and sketchbook! My motto is: "KISS ~ Keep it sensationally simple!" I start this next step by generously wetting the surface of my bird with clean water. I go right up to the edge of the figure so the paint will flow to that point and the strokes will blend together. 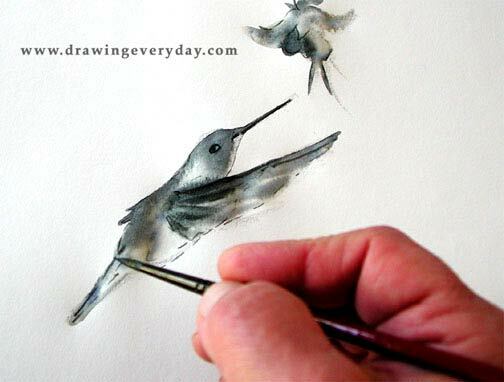 Here I use a thirsty, *dry brush that’s loaded with watercolor paint. I usually use a combination of Ultramarine Blue and Burnt Sienna to make a gray, but any dark color will do. I’m more concerned with value than hue. (See the section on value below.) I start squinting a lot from this point on. This makes it easier to see big shapes and values. I float the pigment into the wet area, giving the figure shape by rendering values and a few details. 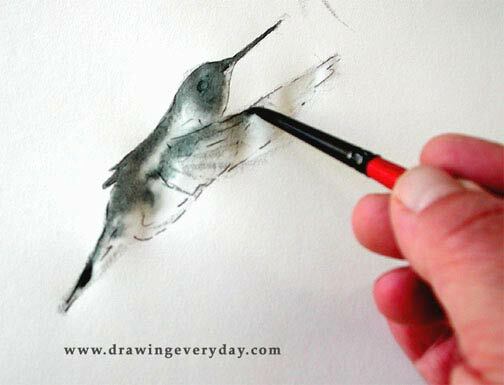 *dry brush ~ The brush is damp, yet dryer than the paper. This is done by loading the brush with thick paint and then using a tissue at the ferrule of the brush to squeeze out excess water. The brush then becomes “dry”, but there’s still lots of pigment on the bristles. See "PARTS OF AN ARTIST’S BRUSH" here. When the area is damp or dry, I add a few more calligraphic strokes. You can soften some hard lines by quickly moistening some strokes with a little clean water and a *dry brush. All I’ve done here is add a background wash after the bird is dry. I do the same thing as in step three. I quickly wet the entire surface where I want my wash to be with clean water, again being careful to stay in the lines. Then squinting, I float in my pigment with a *dry brush. Some wrinkling of the drawing paper will occur. Remember, it’s only a sketch! Sandy holds a Bachelor of Fine Arts Degree from Moore College of Art and also attended The Art Institute in Philadelphia. At Moore, Sandy studied watercolor independently with nationally known watercolorist, Ranulph Bye, whose legacy is the Brandywine and New Hope Schools. More recently, Sandy has been drawn to the teachings of Edgar A. Whitney, and has studied with many modern day masters who once were Whitney’s students. For over seventeen years, Sandy was the owner and art director of Alpha1 Studio, an advertising, illustration and sign company. Since 1996, she has been painting full time and operates her studio from her NJ Pine Barrens home. Collectors of her original paintings can be found throughout North America.